This recipe is a great way to use leftover cooked quinoa, but it is so delicious, you’ll be cooking up extra quinoa just so you can make this. While the nutty flavor of the quinoa is particularly nice in this combo, rice, bulgur or couscous would make good substitutes. For a gluten- (and carb-) free alternative, you could make cauliflower rice by grating it and steaming or sauteing it just enough to get rid of the raw flavor. Leftovers? Just slice up a fresh avocado and add some yogurt. This was such a hit at Brookside Gardens last fall, we thought we’d roll it out again for US Botanic Garden this month. This recipe was adapted from 101 Cookbooks. Warm the quinoa. Grate the peel of the lemon and squeeze out the juice; reserve each separately. Stir salt into yogurt, drizzle with olive oil. Set aside. In a skillet over medium heat gently toast almonds; add coconut flakes and mashed garlic to the skillet. Remove skillet from heat and continue stirring until coconut is toasted and garlic is fully incorporated into nut mixture. Transfer skillet contents to a small bowl and reserve. 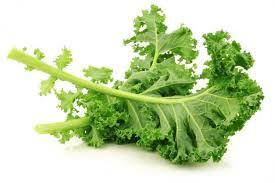 Return skillet to heat; add a splash of olive oil, stir in the kale with a pinch of salt, and cook for just a minute, until the kale collapses a bit, and brightens. Squeeze a bit of lemon juice over it, and transfer out of the pan immediately. 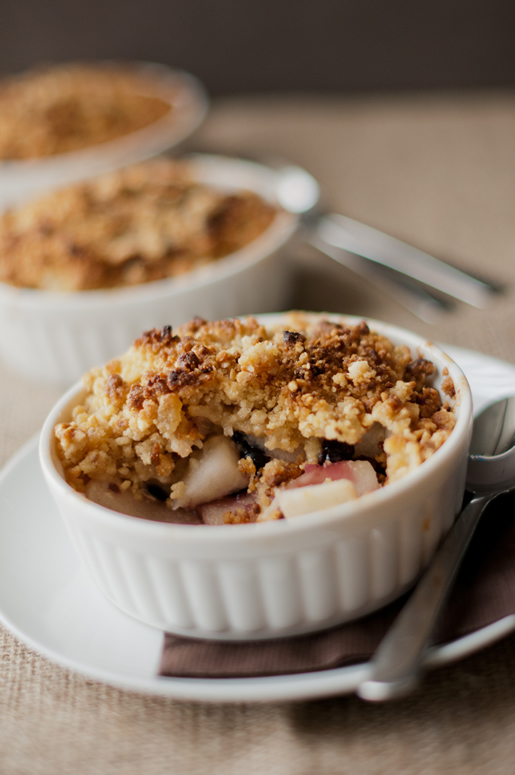 To serve, combine half of the almond coconut mixture with the quinoa in a large bowl. You can serve this individually, or family-style. 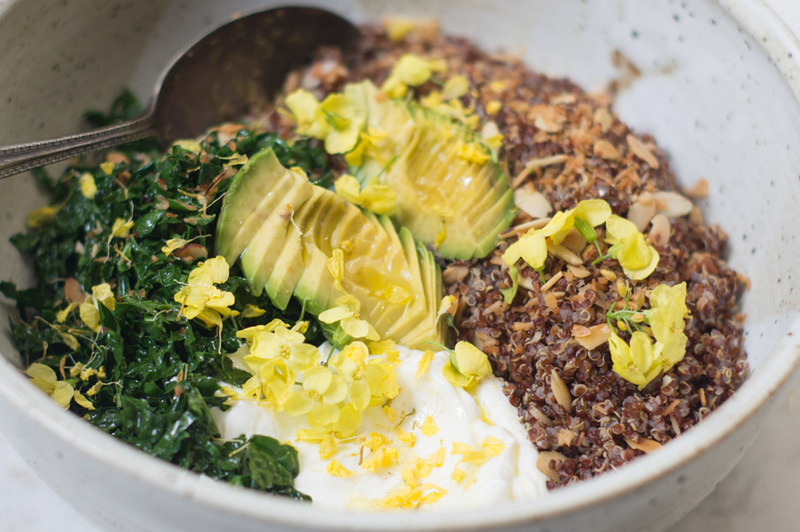 Top the quinoa with the kale, plenty of the salted yogurt, and top with the remaining almond mixture, avocado, and a generous squeeze of fresh lemon juice. Garnish with grated lemon. This soup is totally refreshing and quite beautiful, especially if you use all-red tomatoes as your base, but a mixture of colors for the chunked-up portion. Yellow or white peaches do great in it, as well as nectarines and even apricots. I don’t bother peeling any of the fruit or veggies (tomatoes, that is — I do peel the onions!). If you plan on doing some ahead, just do the pureed part — once the peach chunks are cut up and added, the soup will hold up for only about a day or two. Almonds are optional but they do add a nice crunch and their flavor goes beautifully with peaches. Of course, if you’re coming to eat at our house, you’ll have this soup with a soupcon of red pepper flakes! Demoed by Adrienne at US Botanic Garden August 6, 2015. Adapted from a recipe from Southern Living. Quarter 4 peaches and 2 tomatoes. 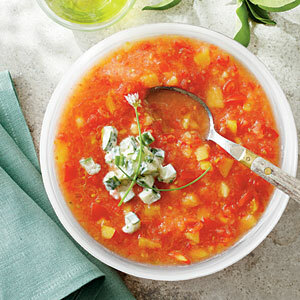 Process quartered peaches and tomatoes, onions, vinegar in a food processor until smooth. Chop remaining peach and tomato. Stir into pureed mixture. Add almonds and mix well. Season with salt and pepper. Cover and chill 1-4 hours. Meanwhile, combine cucumber and next 3 ingredients in a medium bowl. Season with salt and pepper Cover and chill 1 to 24 hours.To serve, ladle soup into bowls, top with 1 T yogurt mixture, drizzle with olive oil, garnish with minced parsley or chives and a grind of pepper. The first taste of spring is all about lemons. Sure the bright, fresh zing of lemons is great almost any time, but there’s something about this time of the year when it has particular resonance. It’s a tonic, a cleanser – of palate and gut (and house for that matter) – a lovely foil for fresh herbs, it goes with so many flavors. So before the garden is serving up its first harvest of stalwart baby greens, tightly packed peas, pointy asparagus and early onions; before ramps appear at farmers’ markets, morels raise their dusky, honeycombed fool’s caps; before the heart of summer sneaks up on you, we look to lemons to bring us sprightly flavor and a break from winter’s stews. 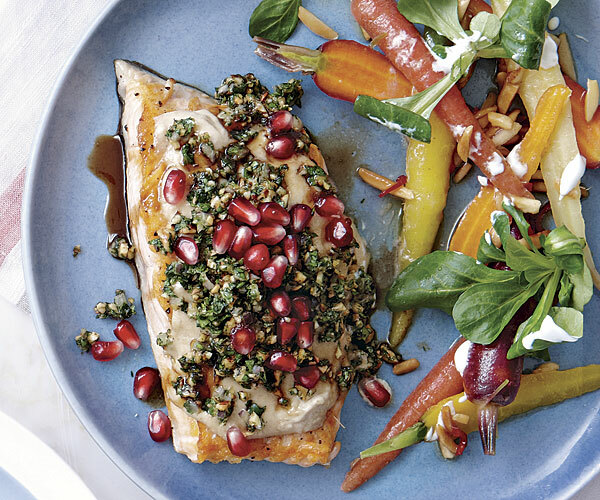 We offer up a spate of spring recipes, many of which deploy this seasonal citrus – lemons are ripe for the picking where they grow in Southern California, Arizona and other parts of the Southwest. This light, lemony cake is based on a traditional Spanish torte. We are accompanying it with ruby-red raspberry sauce for a great spring dessert. 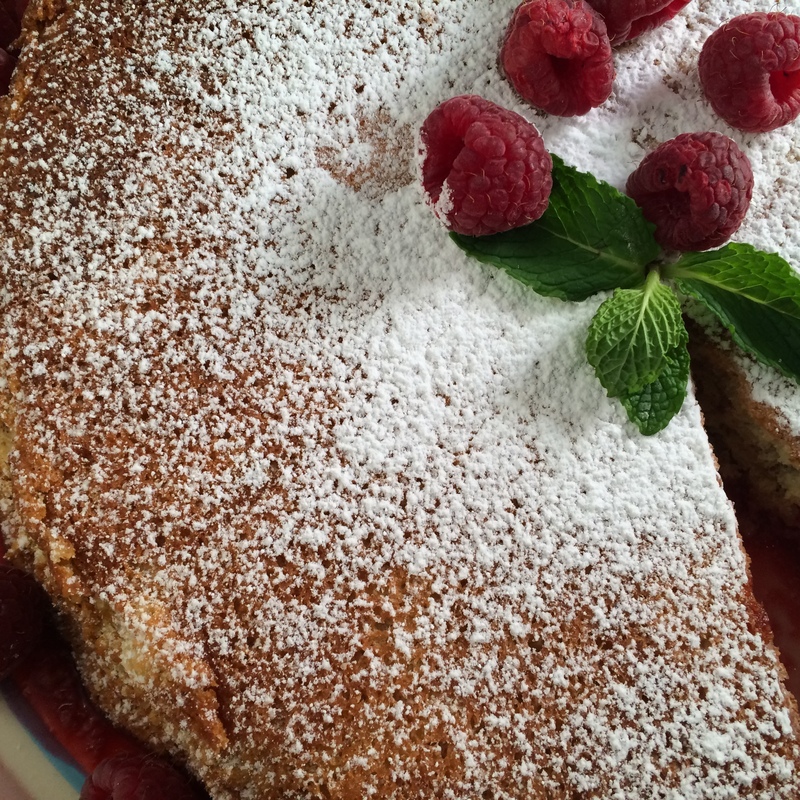 It has the ingredients of a souffle and that dish’s characteristic lightness, but cooks up like a cake – you could even glisten it with a lemon glaze instead of serving it with the raspberry sauce. Add a dollop of whipped cream for a touch of decadence, and don’t forget that garnish of fresh raspberries and sprigs of spring mint. Adrienne demoed this at US Botanic Garden in DC in March 2015. Preheat the oven to 350°. Place a round of parchment paper on the bottom of a 9-inch springform pan, and grease it and the sides of the pan with butter or cooking spray. In a large bowl, beat together with a wooden spoon the egg yolks, lemon zest, and 1/4 C sugar until smooth. Add lemon juice and beat again. In a separate bowl, whisk together almond, cardamom and baking powder. Add the flour mixture to the egg yolk mixture and mix thoroughly. In a separate bowl and using an electric beater, beat egg whites,. As they begin to thicken, add a pinch of salt and the teaspoon of lemon or lime (the salt and the acid from the juice will help the meringue maintain better structure and increase creaminess). As the egg whites begin to increase in volume, sprinkle in the remaining 1/4 C of sugar, a little at a time. Beat until soft peaks form. Fold the meringue into the almond mixture gently to create a light batter. Scoop the batter into a the prepared springform pan and place in the oven. Bake for 25 minutes until a toothpick inserted in the middle comes out clean. Remove from oven and let cool. Run a sharp knife around the edge of the cake helping it to separate from the side of the pan. Release the springform pan sides, and gently move the cake to a cake serving plate. Sprinkle with powdered sugar before serving. Serve with Raspberry Sauce on the side. Combine raspberries and sugar in a nio-reactive pan. Cover and cook on low heat about 10 minutes until sugar is fully disolved and the raspberries are comopletely broken down and lost their shape. Remove from heat and cool. Pass mixture through a small-mesh seive. Refrigerate until ready for use. It will keep in the refrigerator up to two weeks. Combine the confectioners sugar and 1 T lemon juice in a bowl, mix thoroughly, adding more lemon juice as needed to achieve a consisency similar to pancake batter. Spread on cooled almond-lemon torte. Let the glaze harden about 30 minutes before serving.